Sometimes, we are bombarded with so many problems in life that we become so down, we don’t know what to do, and we often forget that there are so many reasons to thank God in spite of all the circumstances that we experience. Today, I would like to remind us of the 3 wonderful reasons to thank God and I hope that this will give us the reason to thank God no matter what circumstances we are currently facing. And may we all rest in the fact that even the problems have good reasons. Thank God for the free air we breathe. How much is an oxygen tank in the hospital? I don’t know the rate, all I know is that it’s expensive, and here we are, breathing the air freely. If this are is gone, we all die in minutes. Thank God for the air! 2. You have a family! Thank God we have a family who love and support us – may bonus pang friends! And these people are always there for us, no matter what happens. They are the reason why we keep going, why we keep striving and we keep working. Did you use alarm clock to wake up today? It’s not your alarm that woke you up – it’s God. Let’s thank Him because we’re well and alive and we can still enjoy life and His goodness! God is so good for always providing our daily needs and not leaving us. I hope these simple reasons can remind us to be thankful for every circumstances. And to be hopeful, that even if we have problems, we can be confident that it will soon be past. Sometimes it is really hard to give thanks when you're down but it is true, be thankful that you are still awake and breathing, it means you still have a purpose. Yes to all three. Give thanks to the Lord, for HE is GOOD and His love endures until forever. =) God bless! I love how this post is so simple but so true. It's all a matter of perspective, I believe. No matter what life throws at us, there will always be something that we can be thankful for. Amen to this! The fact that you are still alive and breathing is a something to be grateful for each day. I sooo agree. We always have something to be thankful for whatever circumstances we're in. Thank you for this reminder. Sometimes we overlook the simplest things that we should be thankful for. Yes, that's definitely right, sis! God bless you too! Yes, amen! A good reminder! they're simple things – but we need to be nudged to remember every now and then! All true! Let us all have a very thankful heart! 🙂 Thanks for this post! Gosh this is so true, Nilyn! I'm quite guilty – I've been complaining about something to God when in reality, it was so petty compared to the blessings He's given us unconditionally. So many reasons to be thankful! That's right, because we forget them sometimes. I'm guilty of that! I have complaints in life too and I forget that God gave me more than enough, so I myself needs to be reminded. hehe. There are so many things to be thankful for that may always seem small. I always thank God for allowing to wake up and spend another day with people I love. 🙂 Minsan when we're down, we fail to see the bright side eh. But there always is a good side. You are so right! 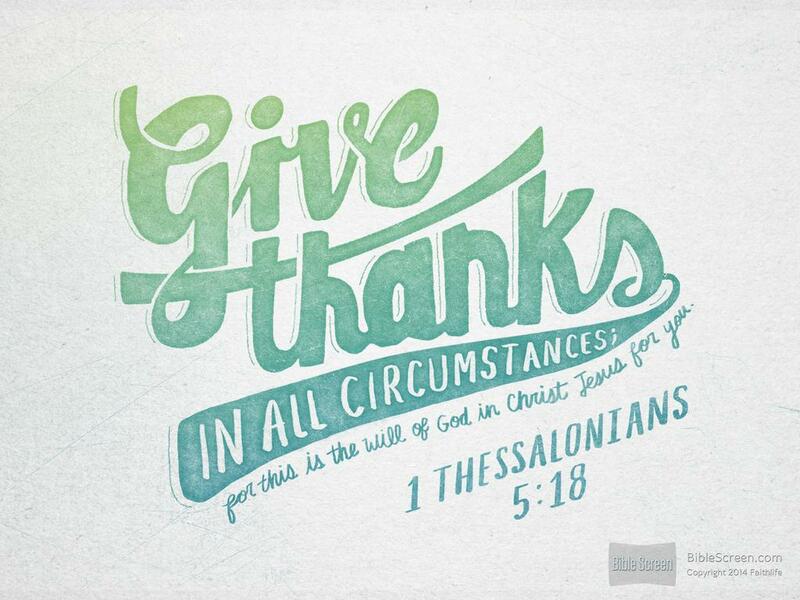 I Thessalonians 5:17 says, â€œPray continually; give thanks in all circumstances.â€ Thanking God on an ongoing basis for everything He provides for us puts joy in our hearts because we are concentrating on the good things in life, and not just ruminating over the bad. Thanks for the reminders!